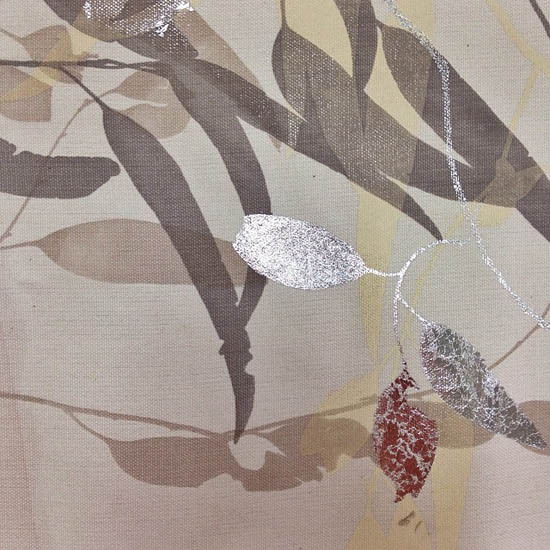 Pinch River - hand printed eco textiles and more...: Metallics in textile printing. Above 'Silver Foil Gum Leaves' by Spacecraft Australia - just beautiful! I'm wondering if metallics is going to be the next big thing... will it be something we see more of in textiles / printing? The reason I'm questioning it is I also came across two other metallic prints recently. One by Laughing Bird - here on her Facebook page and the other by Laikonik - here on her Facebook page. Hmmm... let's see where this is heading. I think if done correctly it can be quite fabulous. Fabric storage baskets / buckets now in stock. Hand printed pure linen tea towels now in store. New product + Pinch River on Etsy.